The saddest fact of his death Tuesday is that he was alone in his New York apartment. He had been ill with pneumonia, according to a friend. He had been having difficulty sleeping, tormented by his recent work as the soul-less, psychopathic Joker in the upcoming Batman film. He had a background of drug and alcohol abuse, which he had reportedly left behind him. And he was also a devoted daddy to his young daughter. I tell the artists with whom I work - please. Take care of yourself. Have a healthy support group. If you have problems with addiction, mental health issues or other demons from childhood, relationships or trauma, do what it takes to get yourself together *before* fame and fortune. Because no matter how successful you might find yourself one day, sooner or later, those troubles will reach out and rip your face off if you try to put them off, stifle them or suppress them. In most cases, it robs people of their careers. But in too many cases, it costs good people their lives. Heath is gone. He is free from pain. But his 2-year old daughter's pain will live with her the rest of her life; his family and friends will suffer his loss until- well, until they don't, which might be never. Please. Take care of yourself. Not just for you - for all those who care about you. Who love, admire and adore you, either personally or from a distance. 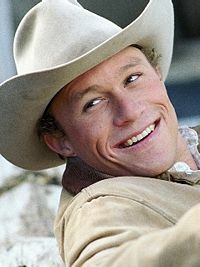 Don't let Heath's death be in vain. Couldn't believe the news when I heard it yesterday. I just knew you'd write about it. So many people look at "stars" from afar and envy them, believing they have everything. And indeed, from our perspective, they do. Looks, fame, fortune, family. The cult of celebrity insists we aspire to be them. Spend our earnings, often our credit, in the pursuit of what is for most an unattainable dream. How poignant to have it revealed that the dream is, for Heath at least, a nightmare, and ironically they (he) would rather be like us. Extras! Extras! See all about it!